" Articles in Category: Eric Bolling	"
First up today: Trump's misleading claim that a new immigration proposal he is supporting will bar legal immigrants from obtaining various public welfare benefits for five years after entering the U.S. Which, by the way, is already federal law, even if Trump either doesn't appear know it, or is simply choosing to lie about it. Trump's new proposal, however, is even crueler, as we discuss today. Also, not discussed by Trump (and barely noticed by much of the corporate media): the weekend bombing of an Islamic mosque in Minnesota. And, also today: Emails obtained from the USDA reveal that employees at the federal agency were instructed to avoid the use of phases such as "climate change" after Trump took office, even when dealing with farming issues that are directly affected by climate change. That on the heels of Trump's nominee for the top science position at USDA, a non-scientist and denialist rightwing talk radio host, having described progressives as "race traitors". 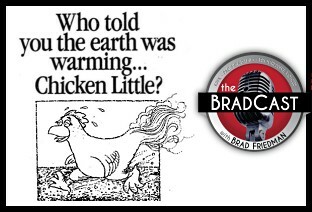 Then, speaking of denialism, we're joined by DAVE ANDERSON of the Energy and Policy Institute on his new report documenting how the nation's utilities companies learned of the threat of global warming decades ago --- at least as long ago as 1968 --- before purposely choosing to mislead customers and the public about it so they could continue to profit from the burning of cheap, dirty coal. The newly reported revelations echo those recently discovered about Exxon and other fossil fuel companies which confirmed the science of climate change and dangers of burning carbon decades ago, before spending millions on climate change denialism in hopes of confusing and misleading both the public and their own investors. "Earlier reports had been commissioned by President Lyndon Johnson, and before him, John F. Kennedy, that also touched upon the possible threat posed by CO2 emissions," Anderson says. "Even way back then, government was starting to get involved in climate research, and it seems like utilities were involved in the creation of those reports, and probably knew even earlier than 1968 that this could be a problem." "In 1971," he documents, "they saw this as a really long term potential issue for power generation. ... Once it exploded onto the front pages of the New York Times, after some pretty interesting Congressional testimony in 1988, it seems like the utilities kind of freaked out. They started looking for people who could spread the message that climate science wasn't legit, and even a hoax." "One of the interesting documents that we found was Congressional testimony by an expert from the Electric Power Research Institute, which is the utility industry's own R&D shop," Anderson says. "He actually warned Congress that if climate change proved to be a major concern, it could actually make the burning of fossil fuels essentially unacceptable. That was a pretty bold statement in 1977." A number of large oil and coal companies have recently been sued for their denialism, in cases which mirror those against Big Tobacco in the 90s. 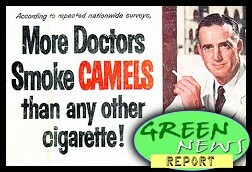 (Which makes sense, since Big Fossil Fuel employed many of the same "experts" and attorneys who spent decades misleading the public about the harms of smoking.) Will the utilities companies, some of which are still lying to the public about this, face similar accountability soon? We discuss that and much more today. IN TODAY'S RADIO REPORT: One year since the deadly West, TX fertilizer explosion: has anything changed? ; New 'habitable' planet discovered! 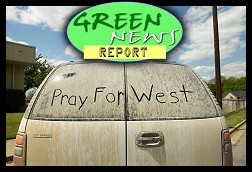 ; Environmental justice: air pollution highest in minority neighborhoods; March 2014 was 4th warmest ever recorded; PLUS: 'Bombshell' study ties record CA drought, cool weather in East directly to human-caused global warming... All that and more in today's Green News Report! 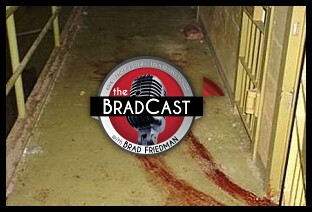 Given that every Sunday network news show decided to completely ignore it, I thought it my duty to read the entirety of the leaked findings from the U.S. Senate Intelligence Committee's report on CIA Torture and Detention on the air during this week's BradCast on KPFK/Pacifica Radio. Also on this week's show, the continually growing evidence of the success of "Obamacare" (and a caller who self-identifies as "full on Left. I'm not even liberal, I'm further Left than that", who takes me to task for citing the facts) --- and why it's time for Dems to grow a pair and start running to not just retain the Senate but also take the U.S. House. A word or two on home-grown Rightwing extremist terrorism and the fecklessness of the Dept. of Homeland Security which, thanks to bullying from Republicanists and Fox "News", cowered from and retracted their report on same back in 2009 despite the mounting death toll ever since. Also, a bunch of good callers and more that you'll just have to tune in to hear about, including a visit by Desi Doyen with the latest Green News Report and some other stuff. Enjoy! Special 'April Fox Day' Edition! 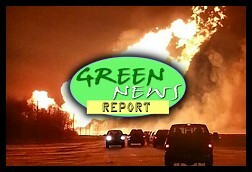 IN TODAY'S RADIO REPORT: Transcanada natural gas pipeline explodes, cutting off heat for thousands; Oil pipeline spills into river in Philadelphia; PLUS: It's a Polar Vortex Redux, making Alaska warmer than most of Florida ... All that and more in today's Green News Report! IN TODAY'S RADIO REPORT: It's official: Hottest spring on record Down Under; Big Fossil Fuel = Big Tobacco; BP suit halts Gulf Oil Spill compensation; New rules for toxic flame retardants; Say goodbye to antibacterial soaps; PLUS: Wall Street may finally be looking to cover its (unburnable) assets ... All that and more in today's Green News Report! Oh, noes! I've been blocked on the Twitters by Eric Bolling, the pretend journalist, pundit, propagandist or whatever he calls himself, of The Five on Fox "News"! Never mind that I've never followed him there, so I'll probably survive having been "blocked" by him, but it seems thin-skinned li'l Eric doesn't like it too much when folks point out the wildly inaccurate "facts" he presents to viewers on his afternoon Fox "News" show. 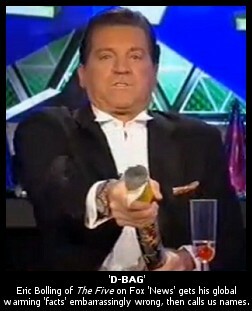 The Twitter exchange between the very handsome Bolling and me is posted below. In full. It's brief. I correct his long-ago debunked falsehood about Arctic ice, he calls me a name and links to a long-ago debunked article in a British tabloid to support his long-ago debunked nonsense, I call him a name and link him to actual facts, he calls me a "d-bag", announces he'll be blocking me, and then offers me and my "miserable life" a warm farewell. It's fun. 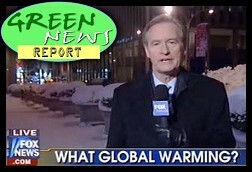 For the record, the exchange started after he misinformed his viewers on his The Five show Monday, in an effort to pretend climate change isn't happening, that "Arctic sea ice is approaching a record high level this year!" But it isn't. Not by a long shot. In fact, the Arctic sea ice minimum extent is at its 6th lowest level ever recorded this year, as those know-nothing, d-bag, loser "scientists" at NASA noted last week, based on satellite imagery. We (and a whole bunch of actual scientists) completely debunked demolished Bolling's canard about this year's Arctic sea ice minimum a few weeks ago, after a British tabloid first put it forward, falsely declaring that the increase in sea ice this year over last year's all-time low, meant that the globe is now "COOLING!"